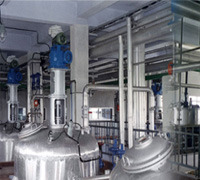 In Inventaa Chemicals Limited - Service Provider of pharma section ultra filtration system, glass lined reactors & columns distillation equipments in Hyderabad, Telangana. Water system is equipped with multiple effect evaporator and Ultra filtration system to stringent requirement of purified water. Inventaa has 100% captive power generation to have uninterrupted and good quality power. Natural resources are used for steam generation. Refrigeration is Steam operated Vapour absorption system. High Vacuum Distillation upto 1mm Hg residual pressure. High Efficiency Solvent Recovery Systems with SULZER Structured packing. For charging operations, state of art MICROMOTION mass flow meters (based on Coriolis Principle) are used to ensure very high accuracy. Integration station works as a firewall as well as a link between dedicated process control workstations & Plant LAN providing Real Time Data to plant and sending Lab analysis to process. Specially designed Incinerator can incinerate Solid & Semi-solid organic wastes. These effluents are treated at very high temperature and thermally oxidized. Inorganic solids are separated with psychrometric evaporator. All the field devices(Transmitters)used to aquire signals for process control are of SMART type which uses HART protocol & communicates digital HART signal to separate AMS (Asset Managment Solutions) system which monitors status, health & configuration of field with built in facility for Audit trials. orkstations (MMI) are used to give operational commands to run batch sequences. A detailed time stamped Event chronicle continuously maintains records of all events in the system which is Tamper Proof.